I now make very few boats a year. Maybe three or four depending on the style. I try to make each one as if it were my own and I want each customer to get, if not a work of art, at least the very best boat I can make that exceeds expectations. $1500 down gets you the next spot on the waiting list. The $1500 is non-refundable. Why? Because when I have a waiting list some folks just won't wait. So then when I get to a boat on the list and the customer who is on the list decides not to go forward with the build, or can't, then I have lost two customers; the one who was in line and the one who didn't want to wait that long. So the $1500 is non-refundable, but it goes towards the boat. Half down of the total cost of the boat when I start. This allows me to buy materials; wood, epoxy, beer, etc. so that I can actually build the boat. A "3/4" payment which is half of the remaining balance at some time during construction. It usually comes about when I hit the halfway mark in building but not always. A cover and trailer payment. A final payment when the boat is done. Not when you pick it up but when it is done. I will store the boat for as long as you want. I now make very few boats a year. Maybe one or two depending on the style. I try to make each one as if it were my own and I want each customer to get, if not a work of art, at least the very best boat I can make that exceeds expectations. I try to gauge the needs of each owner. The water the boat will be used on. The types of trips to be taken. Whether the boat will be used hard daily for fishing or occasionally for family camp trips. Over the years I have designed several boats with different hulls. They all act differently in the water. And just like any other product and any other craftsman, I like to think I have gotten better with time. I change things on every boat. 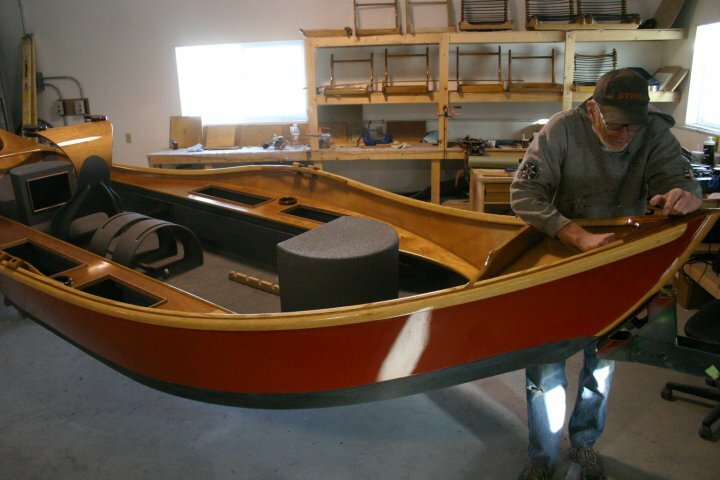 One of the biggest advantages of building the way I do, without the constraints of hull molds like fiberglass boats must have, is that I can change things and adapt. But with all of my riverboats, I strive to use the best materials I can. The woods are all hand selected and I incorporate the best of the newer technology like vacuum bagging composites to ensure that the boats are not only beautiful but as durable as possible. If you have been to a welding shop, a cabinet shop, hired a plumber or an electrician, you know that the hourly rate is high. And there are good reasons for this. Big shops require lights and heat and insurance; employees require living wages. Recently, the cost of materials, especially imports has gone sky-high. Imported wood particularly is very expensive. My hourly rate is $100 per hour. This rate times the hours in a build gets you the overall cost of the boat. Many items are very time-consuming. Some people will say $40,000 for a fishing boat? Well if it’s also of supreme construction and aesthetics, yes. These boats are not for everyone, which is not to say that I build them to be elitist. I simply build them to be the best. Akin to a custom built shotgun ($40,000 is not uncommon), a custom saddle, or motorcycle. In the end, I am pricing the boat where I can make a living. I occasionally get asked: How does your boat compare to a (insert commercially made boat here)? Hyde, Clacka, Aluminum, Plastic, whatever. The answer is they don't. As I said, my idea is to make a boat using the best materials so that it will last forever. The idea of any glass or plastic boat is to make them out of the cheapest materials possible in the fastest manner possible to maximize profit. From the bottom up, the hull is the most durable exterior polypropylene you can find. It's a truck bed liner material that is used on everything from dump truck beds to military landing decks. And no, it doesn't hang up on rocks. Under that is several layers of Kevlar, carbon fiber and fiberglass, all laminated onto a honeycomb core. The result is a bottom that is stronger than fiberglass and gel coat alone, lighter, being air-filled, impervious to rot since water can't get anywhere, and is double-sided. That is, the layers are repeated on the inside and outside. I've never had a hull puncture, ever. The side panel is Okoume mahogany plywood sheathed in a light layer of fiberglass and epoxy. This panel is the best combination of strength and light weight and stiffness. The plywood is not like the construction plywood from Home Depot. It has all mahogany plies with exceptional glues and no voids. Plus it's pretty. And repairable. I've had boats get hit by deer at 80 mph on the road and hit by rocks directly in the side on the river. I've had exactly one hole punched in a side. It actually fractured the inside plies of the wood and outside looked normal. 25 minutes and it was repaired. The exterior finish is automotive quality acrylic urethane sprayed over fiberglass. It's exactly the same as a car. So yes it can be scratched. Unlike gel coats however which never really look the same after the sun gets at them, my finishes can be redone easily. Even just to change the paint color for a new look. Inside, the floor is sprayed with another type of bed liner which is a little more rubbery so that you have some non skid properties and yet it's soft enough to walk on barefoot. The dry boxes and other structural components are made of a combo of laminated plywood and some light fiberglass. The decks are all Okoume mahogany plywood coated in epoxy. Then the whole thing is shot with multiple layers of Bristol Finish, the toughest clear coat you can get. In fact, the clear, or 'bright' finish over epoxy is about the same hardness as gel coat. Maintenance is like a car. Power wash it and the more you keep it clean and covered the longer it looks good. The average to re-coat it is about 5 years. Some boats have gone many more years. The hardwood components like the seats and the rails, trim etc. can be either epoxied and varnished or left natural and oiled. Either way looks good and is easy to take care of. Oil requires more 'wipe-downs' with oil but then never requires sanding to re-coat. This attention to detail and use of expensive materials translates directly into my boats being the lightest, most nimble and most functional boats made. Of that I am unwavering. I have repaired and used every commercially made boat out there. I have seen them inside and out. Fixed holes. Re-done bottoms. Replaced seats. Added rod holders. Fixed gel coats. Painted hulls. So my goal is to have nothing like them. In fact, the only real similarities are that both my hulls and all the others are loosely based on the plywood boats of the '40s. So that's the scoop on the construction. I'm sure you have questions so let me know. Back to the part where you get one. I have a waiting list. It varies from six months to two years. As much as I wish I could make more boats faster, it just doesn't happen. At the height of my shop with seven guys, we made 20 boats. I didn't have any fun doing it either. Now I make them alone (with a little help from my wife and my kids cheering me on). So obviously they are not churning out the door. For that I am sorry but that's just the way it is. I don't promise delivery dates. If you must have a delivery date you can. But I may not make have the boat done by then. This is for two reasons. One is that I go as fast as I comfortably can and try not to make too many mistakes, but it happens and I have to start over. If I go a little heavy on a spray job I have to wait until it dries, sand it down, rip off the masking, apply new masking, (this takes a very long time) and then re-shoot. Sometimes I try to make something work better and I just stand there for about a half hour and stare. I'm not kidding you can come by and watch me stare sometime if you want. Then I'll be even further away from getting your boat done. The second reason is that I don't like stress. It seems to go hand in hand with unhappiness and that is a bummer. I like to have a cold beer near the end of the day. I like to drop my girls off at school. I like to take an afternoon and watch my bird dog watch me miss. I like to occasionally take a powder day and chase trout with lint on a pin. I like to coach my girls basketball team. If I don't do that I start to not like making boats and that doesn't bode well for you or me. When I get emails I answer them and when I get emails asking when the boat will be done I usually don't. It's done when it's done. I'm sorry to be short. But I just don't know. If you miss this summer's best weather I am fairly certain that not only can you still live happily but that next summer your boat will be even more welcomed by the fish and the clear water. In twenty years I have never delivered a boat on time. At least not to a time you wanted. To me, they were all on time. Believe me, if I could get them done sooner I would be able to make some money and meet you in the Bahamas to fish bones. So it's not like I'm trying to be slow. It's just slow work. You'll live. So what if I order a boat for next spring and it's now July? Easy. You might get it next November. I try as hard as I can to get boats done for the spring but sometime, somebody is going to get one in November. That's just the way it is. You'll live. How it works: The Finale. You and I email and talk and you can come and visit and decide exactly what you want right up until I actually start building. Half down when I start. Actually about a month before so I can get everything ordered and here. A cover and trailer payment sometime. A final payment when I finish the boat.